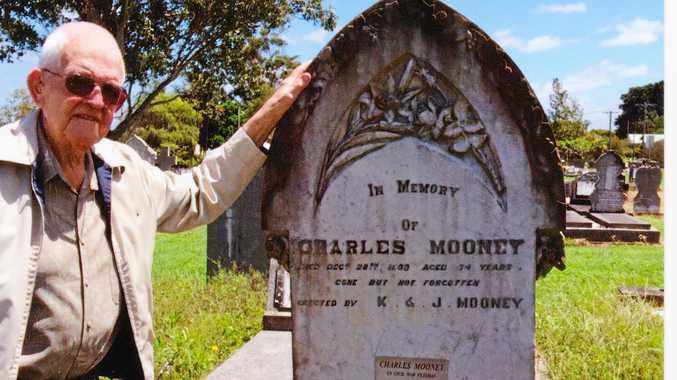 IN ONE of our Tales from the Grave stories recently it involved an American Civil War veteran named Charles Mooney. In the story we mentioned that "thanks to the dedication of a small group of researchers" a plaque depicting Mooney's Civil War experience was able to be placed on his headstone. Well, I can now reveal who was responsible for helping give Charles Mooney the recognition for his efforts in the Civil War. Frederick "Frank" Finch OAM of Kyogle, is 92 years old and is the vice-president of The American Legion, "Yanks Down Under", Post No. 1. For his research and efforts to acknowledge Mr Mooney's dedication to his role in the Civil War, Mr Finch received a Certificate of Appreciation from the legion. "In recognition and sincere appreciation of outstnading service and assistance which contributed to the advancement of The American Legion programs." it said. "I hope that Mooney's descendants have seen the refurbished and (proper acknowledgement) now showing him as a veteran of the US Civil War, as a member of the Army of the Confederate States of America." Mr Finch received permission from descendants and Richmond Valley Council to place the plaque, done by local mason Frank McKey, on Mr Mooney's headstone.